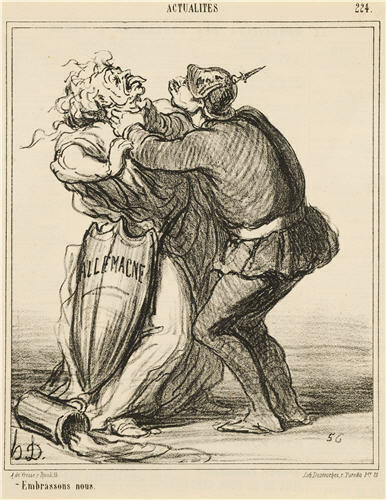 Daumier produced around 5,000 caricatures during his career, which spanned an intense period of political unrest in France. In 1867, in a bid to appear more liberal, Napoleon III lifted the censorship ban he had imposed 15 years earlier. 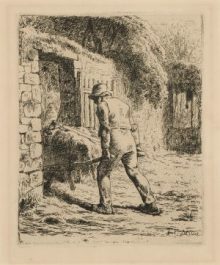 This cartoon was published soon after in Le Charivari newspaper. Entitled ‘Embrassons-nous’ (Let Us Embrace), it shows a French solider throttling the personification of Prussia. Napoleon III’s government encouraged mild satire of this kind as an attempt to ease the seriousness of the situation. Mounting tension between the two countries would ultimately lead to the outbreak of war in July 1870.